If you cannot wait until tomorrow (I know I can’t! ), IDW has given CBR a sneak preview of the first few pages of issue #4! It gives us a glimpse at the first meeting of our titular hero with the much anticipated Tangle the Ring-Tailed Lemur! Sonic arrives at a lovely hilltop town with an ominous giant Buzz Bomber dropping Egg Pawns into the town. Somewhat overwhelmed by the sheer numbers and coordination, Sonic encounters Tangle fending off Badniks with her unique tail. The two team up and dispatch a batch of Egg Pawns with Tangle showing off a confident but sweet personality. We part with our heroes as a giant Motobug tank wheels over the horizon. Evan Stanley makes her return to Sonic comics, and it is a welcome one indeed! The art looks great and I cannot wait to see the full issue! Matt Herms is back to help Evan’s art pop off the page with his colors, and Corey Breen once again contributes the lettering. 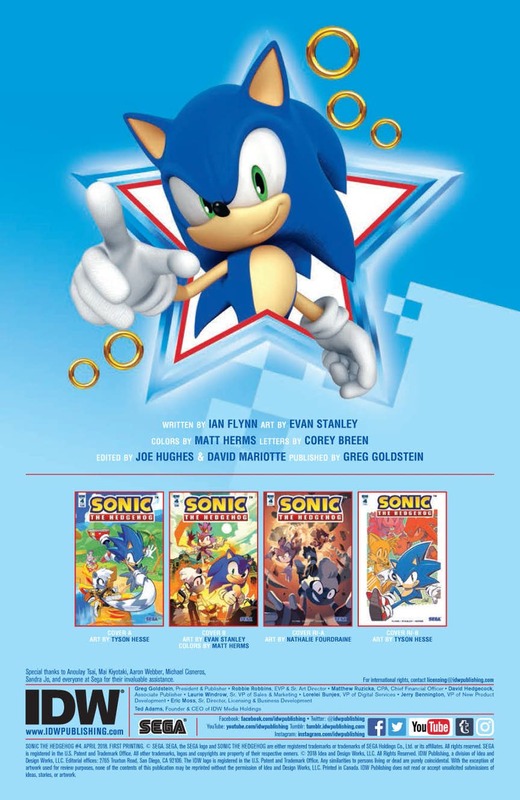 This issue will conclude Ian Flynn’s opening arc and lead into the 2nd arc, “The Fate of Dr. Eggman“, as well as the beginning of the normal monthly issuing of the book. Make sure you get to your local shop fast tomorrow, because the first appearance of this already hit character is sure to be one to remember! And if that was not enough, Blaze will be joining our heroes; it seems like they might need the help! Previous Issue #4 Covers are Here!